Have you ever thought of a career in Nutrition or Wellness? Become a Certified Health Coach. Change your life and change the world while doing what you Love. My own personal health journey led me to one of my greatest passions in life, wellness and nutrition. When I realized that nutrition was something that made me excited, always wanting to learn more, and to help others, I realized that it was the field I wanted to explore. Because my own health issues were healed holistically, by taking care of my lifestyle, I decided to looking into furthering my education so I could help others do the same. Once I decided to do so, I met three women within a five day period that had attended Institute for Integrative Nutrition. I took that as a big door swinging open and decided to learn more about the school and the program. The next day, I signed up! IIN taught me so much, beyond what I thought I would learn. 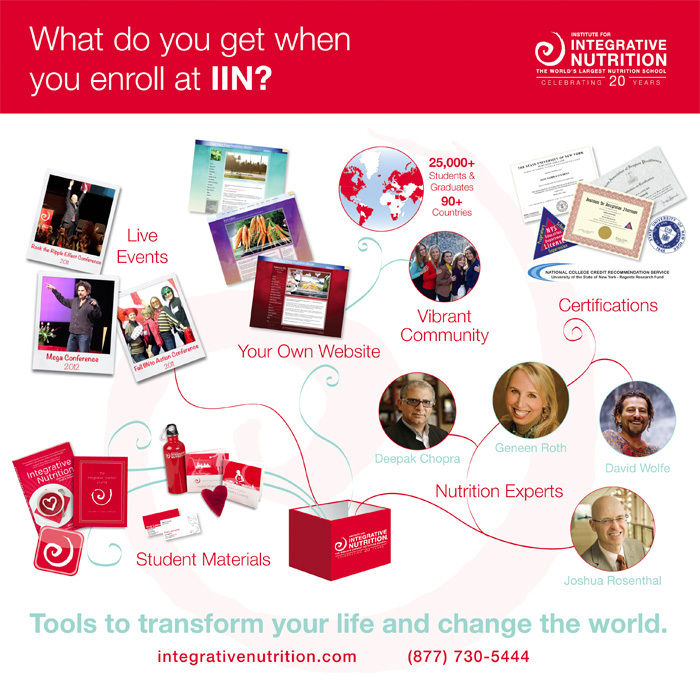 I encourage all that want to further educate themselves in Integrative Nutrition or those that want to build a practice in helping others to inquire about an education at IIN. Let them know I sent you!